After a Strong 2018, Is Kratos Still a Buy? The drone manufacturer soared last year even as other defense names fell. Are further gains on the horizon? Check out the latest Kratos Defense & Security Solutions earnings call transcript. 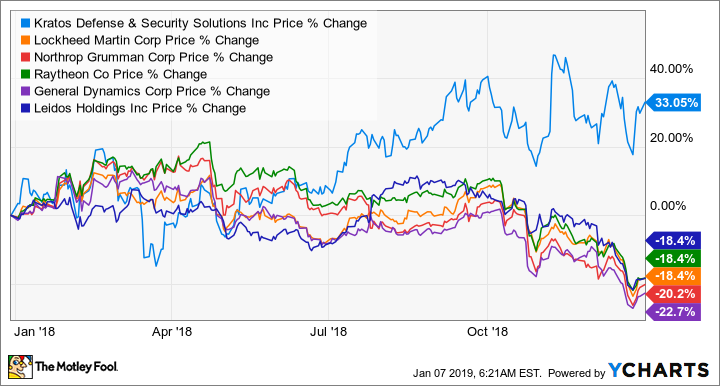 Kratos Defense & Security Solutions (NASDAQ:KTOS) has always been a bit of an anomaly in the defense sector: a high-risk, high-potential-reward company competing in a sector full of slow and steady Dividend Aristocrats. The company's 2018 share performance reflected that divide: Kratos gained 33% on the year, compared to a 20%-plus loss for General Dynamics and Northrop Grumman, and double-digit declines for most of the major contractors. Kratos' performance was even more impressive considering that the company last March was the target of a critical report by short-seller Spruce Point Capital Management, which argued that the company's stock could drop 40% to 70%. Kratos did fall an initial 11% following the report but recovered nicely over the course of the year as it was able to win new business and make progress on some of its most promising development-stage projects. KTOS vs. major defense companies, 2018 data by YCharts. Kratos has been a battleground stock for a long time. Can it deliver another year of outperformance, or will the shorts carry the day in 2019? Here's a look at Kratos' outlook for 2019 to try to determine whether it's too late to jump on board. Kratos started as a wireless-infrastructure vendor and pivoted to become a government contractor last decade. As Spruce Point notes, the company has had its challenges over the years. It spent about $1 billion to assemble a hodgepodge of defense assets that, despite promises to the contrary, until recently had failed to generate a profit. The current optimism surrounding Kratos is focused on the company's portfolio of jet-powered drones: They're fast enough to simulate missiles in test runs and could one day fly as wingmates to combat aircraft. The company primarily sells missile simulators today, while working on its Valkyrie and Mako drone platforms that it hopes will one day fly alongside crewed aircraft providing additional firepower and acting as decoys to distract anti-aircraft systems. Kratos' XQ-58A Valkyrie drone, expected to fly in early 2019. Image source: U.S. Air Force Research Laboratories. Fully autonomous combat systems are still a long way off, but the drone business does seem to be advancing at a good pace. Last year Kratos won U.S. State Department approval to market the Mako internationally. The higher-tech Valkyrie, meanwhile, is expected to have its first flight this year. And Kratos in the last year has rapidly expanded the number of unmanned air vehicles under development, revealing at least five other platforms. Kratos is working with the U.S. Air Force Research Laboratory to demonstrate the Valkyrie and has several other unnamed national security clients looking at its drones. If all goes well, Kratos could get an initial production order for the Valkyrie before year's end, a major milestone in its attempt to shift from making drones for target practice to making futuristic combat systems. There is still plenty that could go wrong, including competition from deeper-pocketed contractors, including Lockheed Martin and Northrop, as well as from drone specialist General Atomics, but optimism is justifiably higher now than it has ever been. Goldman Sachs analyst Noah Poponak in December predicted that Kratos' unmanned systems division could be 10 times today's size by 2025. That's ambitious. But should just some of these drone projects prove their mettle in the years to come, Kratos should be able to grow revenue at a double-digit rate well into the next decade, with steadily improving margins as the aircraft move out of the research and development phase and into production. Individual investors aren't the only ones taking notice of Kratos. The company in recent months has been the subject of takeover speculation, with Dealreporter on Dec. 6 saying that takeover interest in Kratos has "ramped up" along with its drone programs. Investors should take M&A talk with a grain of salt, and the potential for a deal is no reason to buy into the stock. But the whispers, if true, are a validation of how far Kratos has come in the last 12 months. And given that drones should be an area of the Pentagon budget likely to survive potential funding cuts, there is ample reason for defense titans, and investors, to add exposure to these programs. Kratos' remaining non-drone work is also on an upswing. In 2018, the company sold its public safety and security division for $70.7 million, but its tech business in the fourth quarter won a series of contracts, including a $29 million award to develop "prototype technologies, components and subsystems for the enhancement of existing or new Directed Energy (DE) systems," or laser cannons. And its cybersecurity arm got a high-profile win when it was identified as the cybersecurity manager of data transfer and routing operations for Amazon.com's new Amazon Web Services' Ground Station. Kratos, as I said, isn't your typical staid defense stock, and it still isn't recommended for the faint of heart. The company is overvalued relative to other defense names, trading at 39.6 times forward earnings estimates compared to Lockheed's 13.6 P/E. But Kratos, uniquely among defense names, also has the potential to rapidly grow into its valuation. I predicted last April that, despite the criticism being levied at the time, "Kratos either will still be around in five years or will have been acquired by a larger defense contractor at a premium to today's prices." There is still enough uncertainty that the stock should be viewed as a speculative investment. But with every passing quarter, it seems a better bet. There's still time to buy into Kratos.